Calvin Fisher goes in for breakaway. (Photo courtesy of Mike Heiniger). You have to go back to 1974-75 to find another Sages team that finished the regular season with just one loss. The 1965-66 team is still the only one to finish the regular season unblemished. That of course was in a one class system. Although I don’t remember either of those teams (or the two teams in the 1930s that took one loss into the post-season), a solid argument could be made that the 2017-18 Sages team was the greatest in school history. Although it’s too soon the paint hasn’t even dried on Monticello’s thrilling 41-32 overtime win over PBL, as seasons pass in Sages basketball history, fans could simply refer to it as “The Bank.” Trailing most of the game and down 32-29 with 1:25 left in the game, Monticello’s Calvin Fisher lined up for a three-pointer from just right of the key. The ball sailed over the rim, off the glass and through the hoop to tie the score. Zach Fisher has loved the game of basketball since he first got a hold of a ball at the age of 3. Over the years he has turned himself into one of the best pure shooters around and this year among the top scorers in the area (22.3 ppg). Theresa Grentz has done it all in women’s basketball. She has won national championships as a player (three in fact at Immaculata — Watch 1973 title game) and as a coach (at Rutgers). She has guided the Olympic Team (in 1992) and served as president of the Women’s Basketball Coaches Association. She has been inducted into multiple Halls of Fame, ranks 29th– all-time in career victories (with 671) and is the winningest head coach at both Rutgers (434) and Illinois (210), building up programs at both places. This week Matt Bollant finally gets to turn the page. A report released Monday from Pugh, Jones and Johnson confirmed what those close to the program knew all along — that allegations of racial discrimination were completely unfounded. Miller Gym will be packed again Friday as the Sages vie for their fourth Regional title under Kevin Roy. When you think Monticello basketball history, you certainly start with the school’s three supersectional appearances, coming in 1977, 2003 and 2007. However, as the Sages begin the post-season this week, the 2015 brand is working its way into the upper tier. It’s often referred to as “Catching Lightning in a Bottle.” A program gets a new coach who has a ton of promise, perhaps yields a big recruiting class at the onset, but finds long-term it can’t keep up with the giants of the sport. What starts out as a can’t-miss upward trend slowly (or sometimes quickly) fizzles, forcing the program to essentially start over. But for every 20 or 30 of those that fall as fast as they climb trying to break through into that elite group, there are those that have become what I like to call paradigm shifters, ones that provide a don’t-look-back change on the landscape. That’s what Dawn Staley has done at South Carolina and that’s what I see in Illinois with coach Matt Bollant. The 43-year old is building the foundation of a program that won’t teeter when put to the test from the current elite or the future up-and-comers. Anna Dorn was the No. 6 ranked national recruit in the Class of 2010. It was a day after posting one of the most significant regular season victories in school history, a dominating straight sets win at No. 2 Texas, ending the Longhorns 25-match non-conference winning streak. 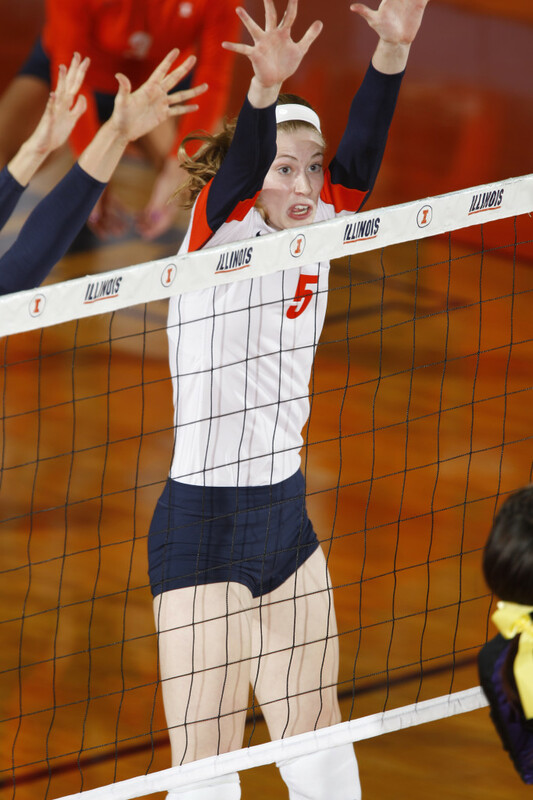 With his club well on its way to defeating Florida A&M, Illinois head coach Kevin Hambly inserted highly-regarded freshman middle Anna Dorn into the line-up, hoping to get her feet wet at the collegiate level. Unfortunately in just her second appearance of the year, Dorn suffered an ACL tear in a play at the net and was lost for the season.